Fast forward eight years and the business has grown further, consolidating its core operations in the West Midlands whilst expanding into tours and executive private hire work, at all times keeping the focus on the bottom line, ensuring only secure and profitable work is taken on. Geoff’s daughter, Ros Hadley, has moved into the MD’s role although Geoff remains very much involved in the business as he approaches his 82nd birthday and still maintains his PCV licence. Three generations are now fully involved in the business with Ros’ sons Nathan and Martin taking the role of Transport Manager and Fleet Engineer respectively. Nathan joined the business in the summer of 2007 following a military career with the Royal Signals Regiment and has brought a new perspective to the operation. 2014 marks a notable year in the company’s history, being the 50th anniversary of Geoff Watts acquiring his first full sized vehicle and the 40th anniversary of Ros Hadley joining the business. Bus and Coach Buyer recently went back to Lye to meet up with Geoff, Ros, Nathan and Martin to learn more about the company’s development. Ros Hadley’s first day in the family business was typical of the commitment she has shown to the business over 40 years, it was New Years Day 1974, the first New Years Day bank holiday but a normal working day at Prospect Coaches. Wanting to be a statistician, Ros started a successful career with HSBC Bank in Birmingham but was unable to secure a transfer to a branch local to home and instead chose to join the then growing family business. Uitilising her banking background, Ros ensured there was a firm finger on the financial pulse of the business as it grew to firstly a leading school transport business in the West Midlands and then a nationally recognised operation in a range of activities. Ros’ 40 years of commitment was recognised in a surprise presentation at this year’s CPT West Midlands Dinner where she was presented with an engraved mirror from Plaxton and a cut glass decanter set from the Prospect Coaches team. Prospect Coaches are CPT members and regularly participate in regional and national CPT events. 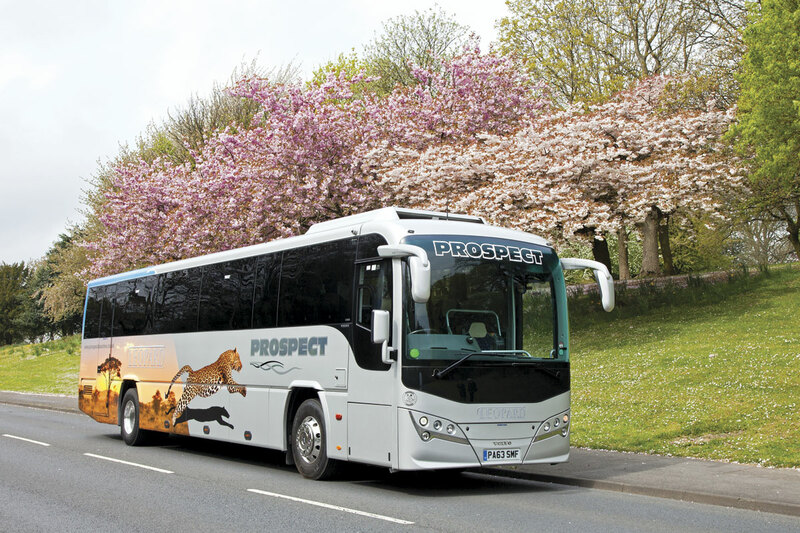 In the past ten years, Prospect Coaches’ operation has almost doubled in size, growing both in the core school and college market and through diversification into executive private hire and tours. Changes in the secondary education system and the drive to education, employment and training for 16-18 year olds have increased the catchment area of many local colleges, students being attracted by a range of measures including free or subsidised travel. Prospect Coaches serve a number of colleges but the core of the operation is their partnership with Halesowen College. This sees up to 32 coaches providing pick up points across Birmingham, the Black Country and north Worcestershire morning and afternoon with 20 vehicles operating additionally at lunchtime to cater for part day courses. Schools are an important source of private hire work with 238 on the books and 99 school to swimming bath contracts operated for the local Dudley Metropolitan Borough. Schools work also includes the provision of vehicles for ‘Schools to Battlefields’ tours into Europe, whilst large numbers of vehicles can be committed to other child transport operations such as Scout and Guide annual outings. The enhancement of the fleet with high specification vehicles sees the company undertaking European tours to destinations in Belgian, France and Poland for organisations such as Rhapsody, Newmarket and, during the February half-term, SGS Ski Plan. Nathan is keenly aware of the need to keep ahead of customers’ expectations, ‘we need to stay a step above, by putting something different in place, thinking forward and doing the right thing.’ Investing in higher specification vehicles for new markets has been one step in this direction but equally important is the company’s investment in people and systems. 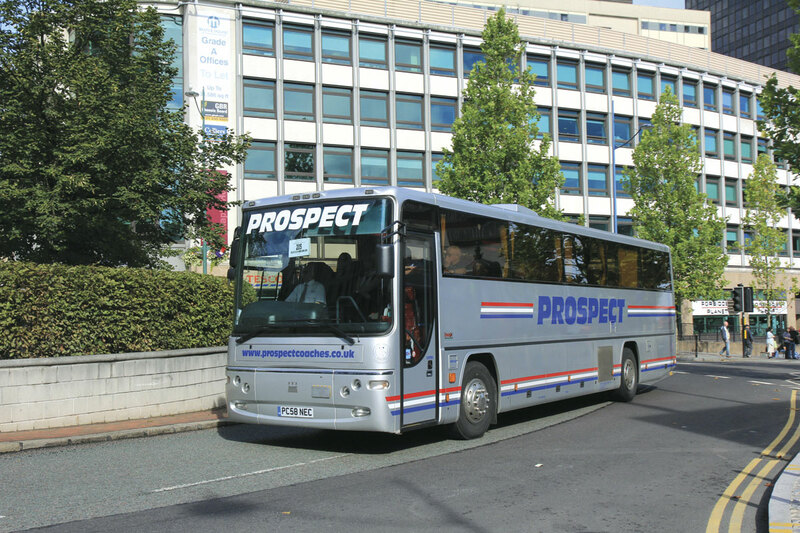 Prospect Coaches have used Distinctive Systems since 2000, Ros considers them, ‘the best software out there and they link directly to Sage for accounting and payroll.’ A RAM web portal accessible tracking system enables knowledge of the location of the whole fleet at all times providing the ability to react quickly to any issues or opportunities. Although the company doesn’t expect alcohol related issues from its driving team, it recognises the growing interest from customers in positive reassurance measures. One vehicle has already been fitted with an Alcolock UK unit and the intention is that 25 further units will be fitted in the coming weeks. 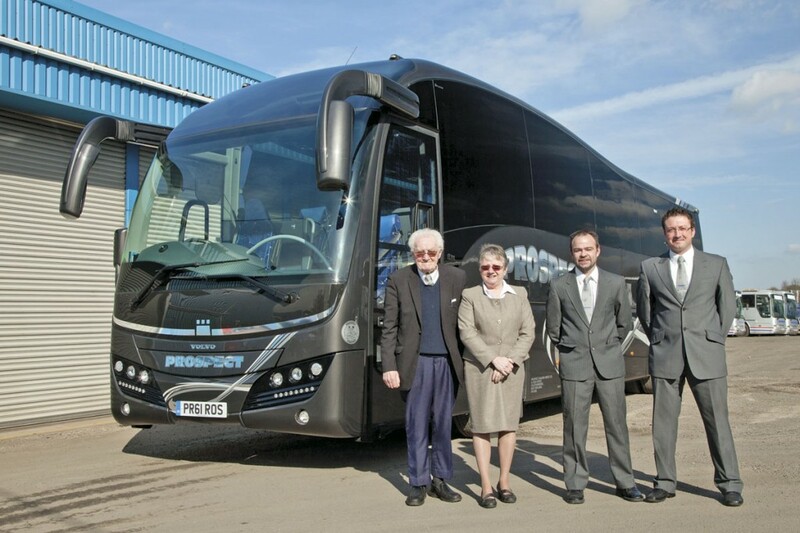 As part of the project, Prospect Coaches will become an agent for Alcolock UK, offering a fitting service for other operators. Continuing the focus on safety, the company has joined BUSK’s Simply Safe scheme and has achieved the top BUSK 6 star benchmark rating. The company’s operational, environmental and health and safety procedures are certified to ISO 9001, 14001 and 18001 respectively. The company believes customers’ on board expectations are growing so two King Long coaches are equipped with three pin sockets providing 240volts for charging devices. Going forward, combined 240V/USB sockets are being considered together with the retrofitting of wi-fi across the fleet.